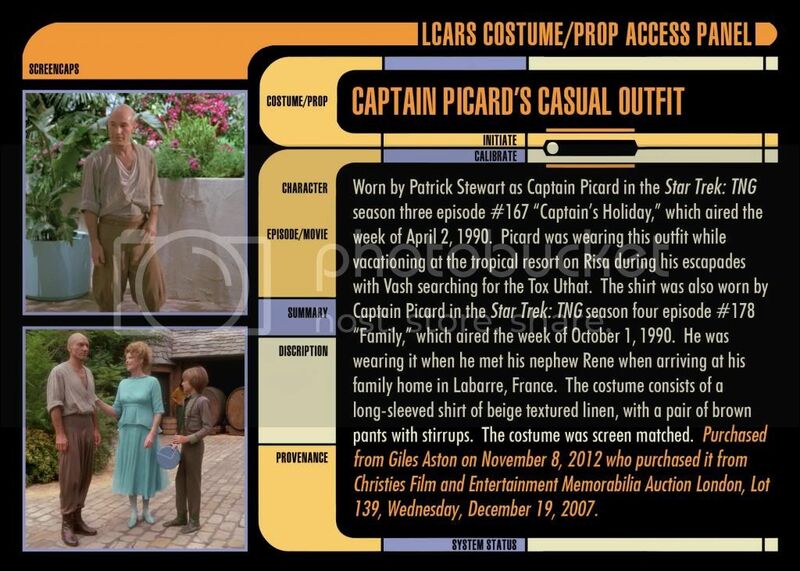 Picard Costume From "captain's Holiday" And "family"
Thanks to Angelo Cifaldi for sharing this! This suit was originally made for the motion picture "The Core" and later rented by the Enterprise Costume Department. Sadly the costume hasn't aged well and jumpsuit and the back pack have had considerable deterioration. Shoes, gloves etc. look fine. It still displays very well, there's no problem to the thick jumpsuit itself, just the outer layer. If interested, contact me and I will pass it on to the seller, a well known Star Trek Prop, Costume & Auction member. He is asking $ 3,000. Star Trek prop collector Paul Savoy posted this awesome lot for sale on the Star Trek Prop, Costume & Auction Forum as well as eBay. It is costume components of Frank Gorshin's costume from "Let This Be Your Last Battlefield". Worn by Frank Gorshin as Bele from the planet Cheron, in episode "Let That Be Your Last Battlefield"
The lot is sold, but this is a good reason to join the Star Trek Prop, Costume & Auction Forum! Propworx customer David Hirsch is a dentist and brings his hobby to work. David has actually converted a screen used Klingon Captain's chair for use in his dentist office! What every Star Trek Themed Orthodontic Office needs- a screen used Klingon Command chair. Just completed the LED base for it. This distinctly iconic Klingon bridge chair was custom-made by the production for use by various actors and as set dressing in the various Star Trek television series including Star Trek: The Next Generation. Two add-on components, above the headrest and on the back are attached with screws and were also used separate from the chair in various episodes including the season seven episode of Voyager titled "Repression". Truly amazing and congrats to David for really making his hobby part of his daily life!